The construction of the much-awaited Hindu temple complex in Abu Dhabi in the United Arab Emirates is moving swiftly, as India is working closely to inaugurate the temple during prestigious Expo 2020 in Dubai. Marking an important milestone on its path to constructing the temple, BAPS Swaminarayan Sanstha, the main force behind the temple project, along with Mandir Limited, a newly formed body to handling the construction, announced that it has chosen a Singapore architectural firm to lead and oversee the design and construction of the temple complex. 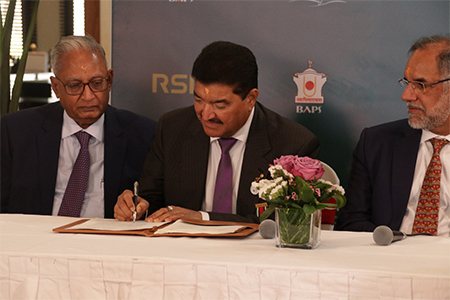 The agreements were signed by B R Shetty, Chairman of Mandir Limited and Lai Huen Poh, Global Managing Director of RSP Architects, Planners and Engineers. Speaking on the occasion, hailing UAE, the Indian Ambassador said UAE has the highest spirit of tolerance and brings people of all faiths and cultures together to develop a monumental project in the UAE. 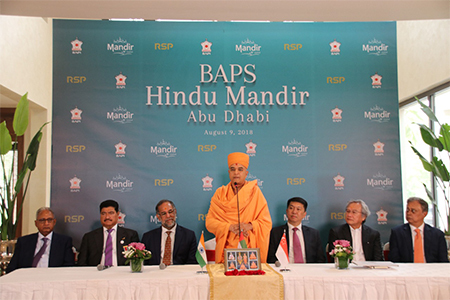 Suri emphasised that the Indian community must work with ability and efforts to honour the commitment which was made by Prime Minister Narendra Modi for the temple construction.